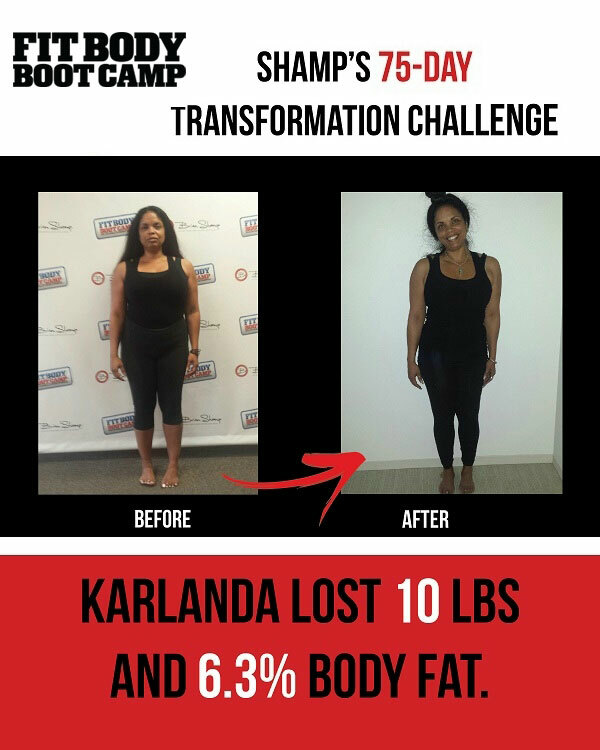 Karlanda was the winner of the 2015 75-Day Holiday Transformation Challenge! Below is her testimonial. Brien Shamp’s boot camps work! I hate taking pictures always have. But I was forced to take one after I lost my driver’s license. When I received the DL in the mail the photo was a picture of my mother!!! WHAT??? I have now become my mother, double chin and all. I love my mother but she is 24 years older than I am!!!!! I started to think what happened!!! When did I stop wearing skinny jeans??? The last time I remember was four years ago. I now only wear skirts that stretched and when I was not wearing them I was in the ever forgiving leggings. They always fit no matter what size you are. Okay, time for a change… I have always had my 24 Hour membership so I decided to finally put it to use. But I would never get on that dreaded scale and was not motivated to go more than 2-3 times a week. Thinking to myself at least you are going to the gym but still eating whatever I wanted. “Hey you have to live” I would tell myself. Who wants to just work out and not enjoy life? RIGHT! But nothing happen in fact I was getting bigger. I started to think about plastic surgery and maybe ordering some steroids something because I swear I am not even eating that much and I AM going to the gym, but all I see in the mirror are the signs of a tired older woman with flabby arms, stomach and that same old double chin. I almost backed out because what was the first thing you have to do? That is right… get on that dreaded scale, the scale that I have avoided for years!!! But I did it and now 75 days later and I feel very proud of myself. I never entered into this transformation to win the prize but just to push myself and hold myself accountable. My results below has given me the motivation that I can do this, I will do this and I am not giving up till I reach my goal. Setting goals and check on the progress once a week at class. Know that if I eat or drink something that might not be in the plan that is not “the end” but I have get back in there and continue the race. I cannot say enough wonderful things about your bootcamp. The variety keeps me interested, and I am never bored. I plan on moving to San Jose but I am still coming to “MY” bootcamp. This is now a way of life for me, and your bootcamp is family. Thank you thank you thank you Brien, Shannon, Mike, Gerard and Tonya for encouraging me along the way. I still have a very long way to go and I know you all will be there for my next 10-20 lbs loss. I would have not been able to do this without your support and positive energy. Brien Shamp’s Fitness, Nutrition & Coaching is passionate about improving the Quality of Life of our coaching clients through Award-winning Group Personal Training, Cutting Edge-Nutrition and Trans formative Life Coaching.